Remove stem from cleaned apples and insert stick into the middle of the fruit. Heat caramel for 30 seconds in microwave, or until liquid becomes smooth. Dip apples in hot caramel and place on tray covered in wax paper. Place apples in fridge to cool for 15 minutes. In saucepan, melt AERO bars over low heat, stirring occasionally. Dip caramel apples into hot chocolate and set on wax paper. 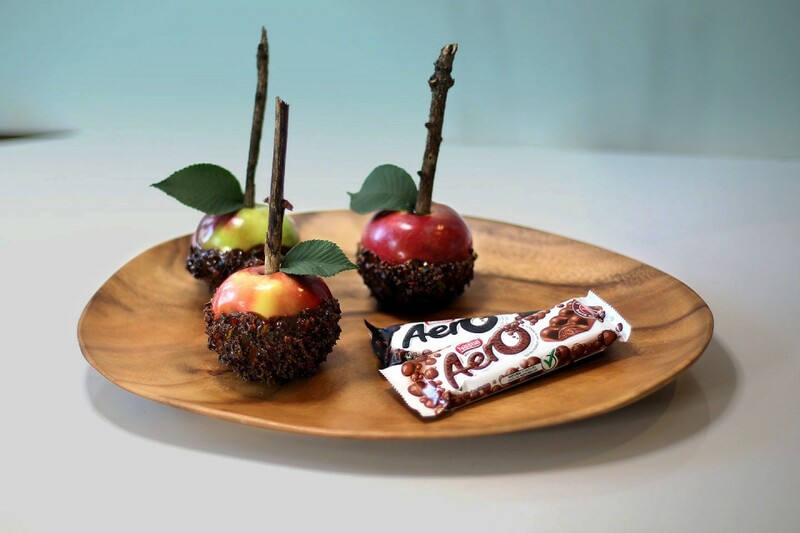 Decorate your candy apples with crushed AERO chocolate and SMARTIES, or as desired. Once chocolate has cooled you are free to enjoy! If you prefer, you can melt your AERO in the microwave. For best results break the bar into pieces first, and stir every 15 seconds until melted. For a spookier look, use sticks you've collected outside. Just make sure to wash them first!